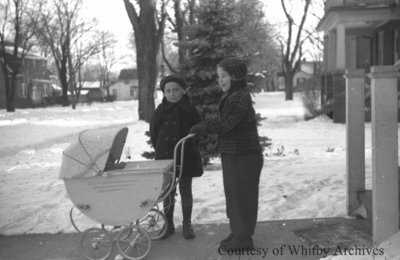 A black and white negative of Marian Rowe dressed in a snowsuit and pushing a pram on the walkway outside of her house. In this view their is an unidentified child standing behind the pram and facing the photographer. Marian Rowe, January 1938, Marjorie Ruddy. Whitby Archives A2013_040_661C.